A hundred years before Blackbeard and Captain Kidd sailed Virgin Island waters in the early 1700s, the first Queen Elizabeth backed privateers whose Caribbean successes made later pirates look like petty thieves. With accumulated loot from Spanish ports and ships estimated to total more than 120 million dollars in today’s money, Sir Francis Drake led the pack in the late 1500s. Drake, the son of a commoner farmer, is memorialized by Sir Francis Drake channel, which weaves through British and U.S. Virgin Islands, and “Drake’s Chair,” a mountain top spot on St. Thomas from which the Admiral supposedly watched Spanish Puerto Rico. Few realize, though, that Virginia was first colonized by the English in part to provide a base from which to protect vital Caribbean shipping lanes and support raids by such privateers against Spanish New World fleets and colonies, says James Horn, a College of William and Mary scholar in his book “A Land as God Made It.” It was no coincidence that Privateer Christopher Newport transported the first permanent colonists to Jamestown in 1607. 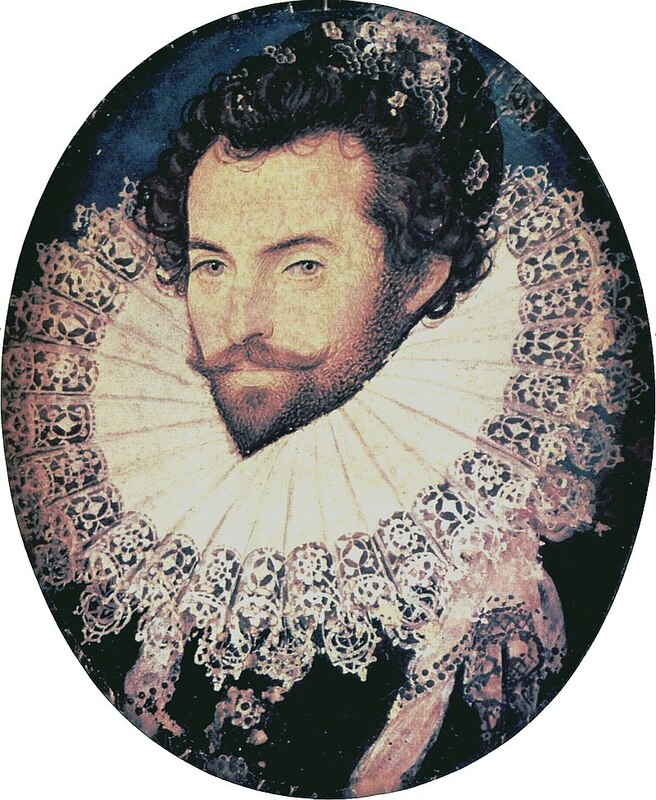 Twenty years earlier, in 1586, Drake himself rescued the first settlers from Sir Walter Raleigh’s fabled colony called “Virginia,” although located on Roanoke Island between North Carolina’s Outer Banks barrier islands and the mainland. Tobacco, indigo, coffee and potatoes from the New World were certainly valuable back in England. But, these fruits of hard, risky farming couldn’t compare with Spanish gold and silver from Mexican and Peruvian mines, pearls from the Spanish Philippines shipped to Panama for transport home, and emeralds mined from what’s now Columbia. Superior British seamanship and naval technology placed these unbelievable spoils within reach for those daring enough to go after them. 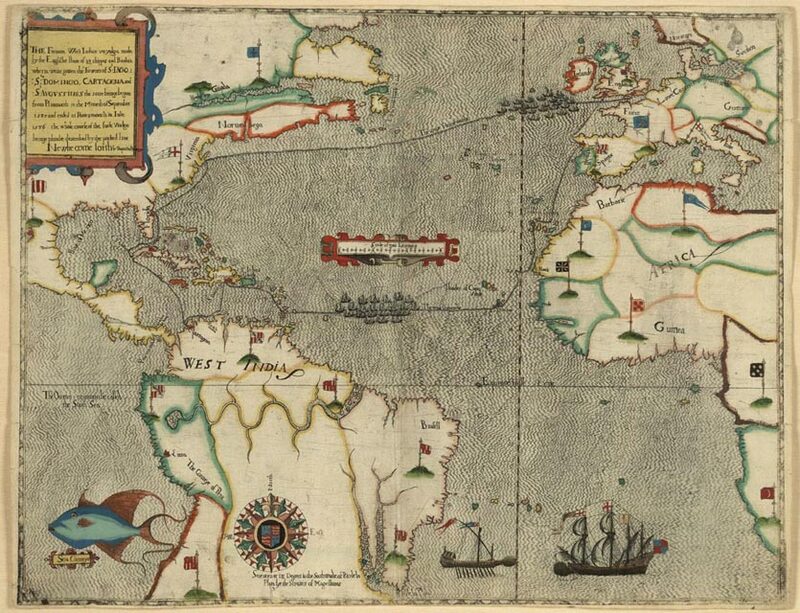 On just one voyage in 1585-86, Sir Francis Drake’s “Great Expedition” fleet captured and sacked the entire ports (including store houses) of Cartagena, Columbia, and Santo Domingo, the city founded by Columbus and capital of the Spanish island of Hispaniola. Recognizing the value of a regional base, during that voyage Drake also played a role supporting a North American colony. With 25 ships and 2,300 sailors and soldiers, Drake’s Great Expedition fleet was the most powerful armada to cross the Atlantic. In an earlier adventure, Drake had circumnavigated the world, plundering Spanish Pacific Ocean assets. His second in-command on the new Expedition was Martin Frobisher, a successful privateer who had also led three expeditions to the arctic in search of the Northwest Passage. Nevertheless, by the time Drake had sacked Santo Domingo, the tropical fever had killed as many as 500 men and weakened many more. He decided to return to England by way of Florida where the Spanish were known to have an outpost. These men, who had been exploring the coast, led Drake’s fleet north and through Ocracoke Inlet to Raleigh’s Roanoke Island settlement in June, 1586. There, they found 103 men under the command of Governor Ralph Lane. Although Lane had written back to England describing the new land as the “goodliest and most pleasing territory in the world,” Drake found the colonists seriously short of food and other supplies. They had alienated the local Native Americans who became hostile and refused to help them grow local crops. Judging their situation to be desperate, Drake offered to either leave behind adequate supplies and a ship or take Lane and his men back to England. Lane decided to return to England with Drake. They had no way of knowing that Sir Walter Raliegh had separately sent a relief expedition with supplies and more men that arrived in Roanoke a short time after Drake and Lane had departed. 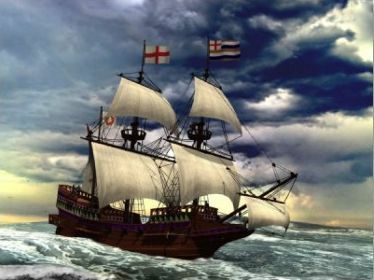 When Drake’s fleet reached home in July, 1586, the Roanoke colonists introduced tobacco (in the form of snuff), corn and potatoes to England. The products (and Drake’s Spanish plunder shared with the Queen) built more support for colonization among the ruling class. Sadly, England’s costly defense against invasion by the Spanish Armada and other developments in following years helped doom the Roanoke colony. Nevertheless, Governor Lane’s “Virginia” publicity and the success of Drake and other privateers set the stage for founding the first successful English North American colony at Jamestown in 1607.